The Environmental Protection Agency apologized on Tuesday for leaking millions of gallons of wastewater into a Colorado river, but members of Congress from both parties say the agency needs to do more. Sen. Cory Gardner (R., Colo.) acknowledged EPA’s admission of responsibility in a Tuesday statement but said that the agency has not been sufficiently cooperative with Congress. He called for congressional hearings to investigate the matter. "Although the EPA has finally acknowledged the magnitude of the crisis, its ongoing lack of communication and coordination must be rectified," Gardner said. "The local communities and industries that rely on the river for their livelihoods deserve transparency, accountability, and an explanation that is far-past due." 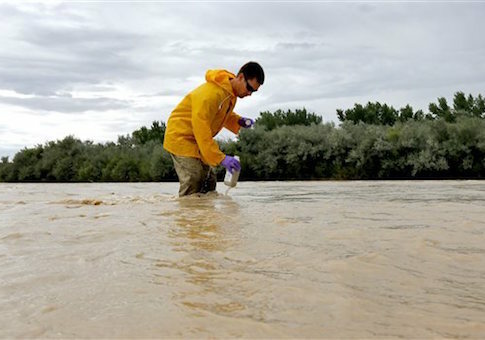 EPA chief Gina McCarthy on Tuesday acknowledged her agency’s role in the spill, which poured an estimated 3 million gallons of toxic waste into the Animas and San Juan rivers. "It is really a tragic and very unfortunate incident, and EPA is taking responsibility to ensure that that spill is cleaned up," McCarthy said. Gardner said her response was wanting. "It’s outrageous, reckless, and unacceptable that it’s been seven days since the EPA released three million gallons of toxic waste into the Animas River and the federal agency still has few answers." The freshman senator added that he is "requesting congressional oversight hearings to examine the EPA’s insufficient response and to ensure that the EPA is held to the same recovery standards as the private sector." In a separate letter sent on Tuesday evening, Gardner, Sen. Michael Bennet (D., Colo.), and Rep. Scott Tipton (R., Colo.) asked McCarthy to quickly develop and share a plan to mitigate environmental damage, and dispatch "a full emergency response team" to the area. EPA workers triggered the massive wastewater spill while investigating an abandoned gold mine near Silverton, Colorado, last week. Contaminated waters now contain high levels of arsenic, lead, and other heavy metals. Gardner, Bennett, and Tipton asked McCarthy to visit the area and meet with affected residents in yet another letter on Tuesday. "Local residents, recreationalists, and business owners need to know that EPA will commit to a full cleanup of the accident and work to ensure the full environmental and economic recovery of the affected area," they wrote. Even members of Congress from surrounding states are voicing concern that their constituencies could be affected and asking the EPA pointed questions about its role in triggering the Animas spill. "These millions of gallons of toxic sludge … threaten the integrity of Arizonans’ limited drinking water resources, but also surrounding farmland and ecosystems, including the world-renowned Grand Canyon," wrote Rep. Matt Salmon (R., Ariz.) in a Tuesday letter to McCarthy. Salmon said the spill highlights concerns with a proposed EPA regulation known as the Waters of the United States rule, which would give the agency unprecedented regulatory authority over even small bodies of water. "Clearly, this incident reveals the fact that the EPA cannot handle the responsibilities it had before unilaterally expanding its regulatory authority with the new WOTUS definition," Salmon wrote. "It cannot go unmentioned that had such a spill been caused by a private entity the EPA would have levied onerous fines and punishments against it," he added. This entry was posted in Issues and tagged Cory Gardner, EPA, Gina McCarthy. Bookmark the permalink.